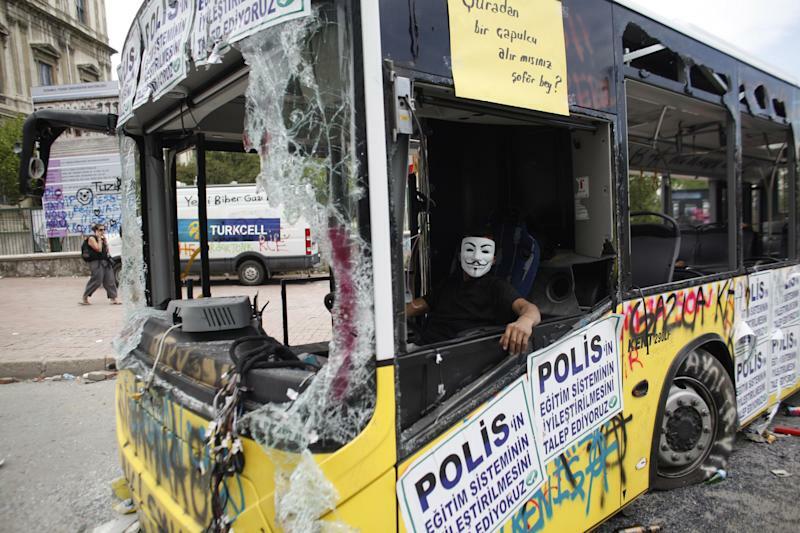 ANKARA, Turkey (AP) — Turkey's prime minister was walking a political tightrope Thursday as he headed home from a four-day trip abroad to face massive anti-government protests that have mushroomed to dozens of cities across the country. Speaking before leaving Tunisia to fly back to Istanbul, Recep Tayyip Erdogan attempted a balancing act. He appeared to soften his tone in an effort not to inflame protesters who see him as increasingly autocratic, while not conceding enough to appear weak to the base that has helped him win three landslide elections. Thousands of supporters thronged the airport for his arrival, chanting "We are with you, Erdogan," in the first major public show of backing for the prime minister. Hundreds marched among the cars of traffic-clogged streets towards the airport, waving Turkish flags and chanting "Istanbul don't sleep, defend your leader." Erdogan's reaction will be decisive in determining whether the demonstrations fizzle out or rage on. So far, a police officer and two protesters have died and thousands have been injured in nearly a week of clashes with the police. His comments don't appear to have swayed many of the thousands of protesters who thronged central Istanbul's Taksim Square for a sixth day Thursday. More than 10,000 others filled a busy street in a middle class area of Ankara. In his comments in Tunisia, Erdogan acknowledged that some Turks were involved in the protests out of environmental concerns, and said he had "love and respect" for them. "His messages were a lot softer than when he left. But they were not soft enough," said Sukru Kucuksahin, columnist and political commentator for Hurriyet Newspaper. 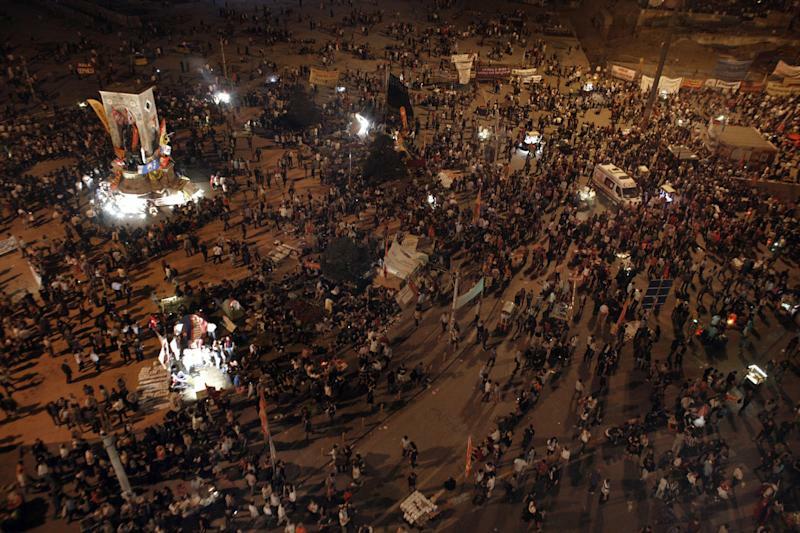 "On the other hand, I don't think that the demonstrations will continue with such intensity forever." The protests started last week over objections to Erdogan's plan to uproot the square's Gezi Park to make way for a replica Ottoman barracks and shopping mall. Police's extensive use of tear gas and water cannons outraged many and sent thousands flooding into the square to support what had, until then, been a small protest. Erdogan rejects the claims, saying he is a servant of the people. In Tunisisa, he claimed terrorists had gotten involved in the protests, saying an outlawed left-wing militant group that carried out a suicide bombing on the U.S. Embassy in Ankara in February was taking part. "They are involved. They have been caught in the streets and on social media," he said. He also stuck to his determination that Taksim Square would be redeveloped — although he said the plan would include the planting of trees and the construction of a theater and opera. He had earlier said the plans included the construction of a shopping mall. Erdogan said the Islamic-rooted government had already apologized for the violent police crackdown on the Taksim sit-in, but that tear gas was used everywhere in the world to break up protests. "Demands cannot be made through illegal means," he said. The prime minister has insisted that democracy happens only at the ballot box, dismissing the demonstrators as an extremist fringe. Erdogan has seen his support steadily rise since he first won elections in 2002 and garnered nearly 50 percent of the vote in the 2011 ballot. But his critics — and some members of his traditional support base of religious, conservative Muslims — point out that even with half the electorate behind him, he cannot ignore the wishes of the other 50 percent. "As a leader you have responsibilities and duties toward your people, even if you don't share their beliefs," said Osman Emre Uygun, a restaurant owner in Istanbul's Hurriyet Mahallesi neighborhood, a traditionally conservative, Erdogan-supporting area. "That means even if they are not Muslim, you have to defend their rights. We want some common sense. We want him to listen to the protesters and their demands." Koray Caliskan, professor of political science and international relations at Bosporus University, pointed out that "Turkey is absolutely at a crossroad. Erdogan won't be able to point at Turkey as a model of democracy anymore." The prime minister, he said, was maintaining a hard line because "until now Erdogan had always gained support by increasing the tension in the country." Caliskan said the prime minister was surrounded by people too afraid to confront him and was out of touch with what was really happening in protests on the streets of Istanbul and Ankara. "He couldn't see that there were also people from his grass roots there. There are cracks within his party." More than anything, it was the violent police response to what was initially a peaceful sit-in in one of Istanbul's last remaining parks that galvanized his opponents. 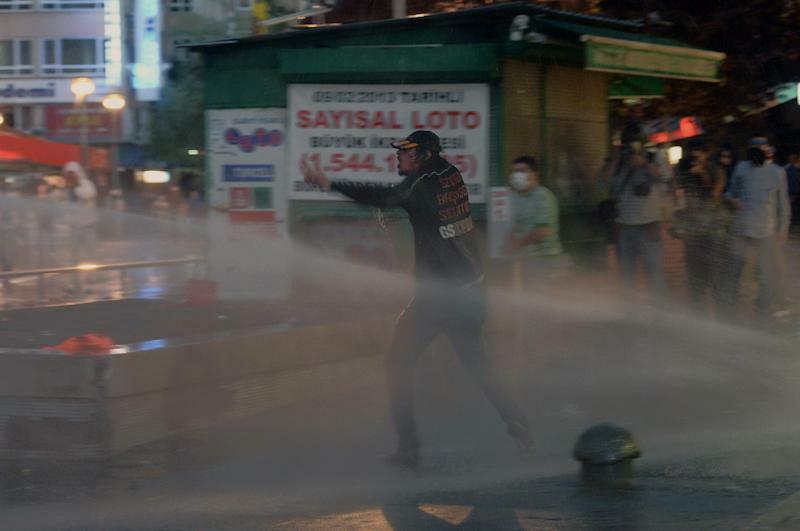 "Erdogan's solid legend evaporated as tear gas rained over Turkey," Caliskan said. Interior Minister Muammer Guler insisted police abuses were being investigated. He said police only dispersed protests that had turned violent, and that many officers had acted with restraint despite provocations. Huseyin Celik, deputy leader of Erdogan's Islamic-rooted party, said the government is sympathetic to secular-minded Turks' concerns and is prepared to take steps to "eliminate" their fears. Officials said seven foreign nationals were detained during the protests: two Iranians, two French, an American, a Greek and a German. Becatoros reported from Istanbul. Ezgi Akin in Ankara contributed.